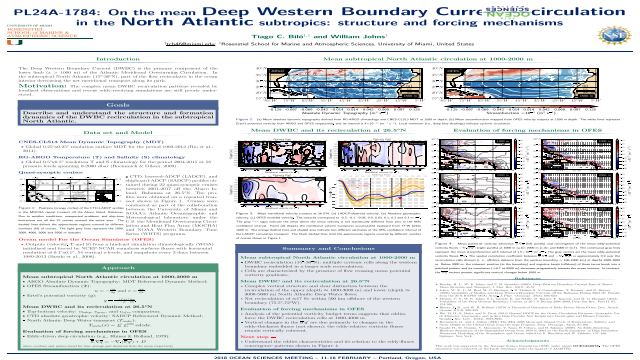 Author(s): Biló, T. C.; Johns, W. E.
Abstract: The Deep Western Boundary Current (DWBC) is the primary component of the lower limb of the Atlantic Meridional Overturning Circulation. As the DWBC flows equatorward it carries North Atlantic Deep Water (NADW) in highly variable and dynamically complex pathways. In the subtropical North Atlantic (15-30N), part of the flow recirculates in the ocean interior decreasing the net meridional transport along its path. In this work, we investigate the DWBC recirculation patterns and forcing mechanisms at 15-30N using observations and outputs from an eddy-resolving (OFES) hindcast simulation. We use ARGO-derived absolute geostrophic velocity and the OFES model to study the ocean circulation at 1000-2000 m depth. Both model and observations show that the mean DWBC recirculation is composed of multiple cyclonic cells embedded in a larger scale recirculation. The cells are also characterized by the presence of flow crossing mean potential vorticity (PV) gradients, requiring forcing to maintain them. The OFES outputs indicate that eddy-PV fluxes are responsible for forcing the recirculation at z ~ 900-3000 m and present significant changes in the thickness fluxes with depth while relative vorticity fluxes remain vertically coherent. To better investigate the vertical structure of one of these cells, more than 20 lowered-ADCP quasi-synoptic transects obtained in the last 15 years are used to analyze the mean velocity patterns of the DWBC and its adjacent recirculation at 26.5N. Our analysis reveals a clear distinction between the recirculation of the upper (z ~ 1000-3000 m) and lower NADW flows (z ~ 3000-5000 m), with a net recirculation of approximately 10 Sv of the 30 Sv that is flowing southward in the DWBC.Summary: In this study, we investigate the Deep Western Boundary Current recirculation patterns and forcing mechanisms at 15-30N using observations and outputs from an eddy-resolving simulation.References: Bryden, H. L., W. E. Johns, and P. M. Saunders (2005), Deep Western Boundary Current East of Abaco: Mean Structure and Transport, J. Mar. Res., 63(1), 35-57. Johns, W. E., L. M. Beal, M. O. Baringer, J. R. Molina, S. A. Cunningham, T. Kanzow, and D. Rayner (2008) Variability of Shallow and Deep Western Boundary Currents off the Bahamas During 2004–05: Results from the 26 N RAPID–MOC Array, J. Phys. Oceanogr., 38(3), 605-623. Meinen, C. S., W. E. Johns, S. L. Garzoli, E. van Sebille, D. Rayner, T. Kanzow, and M. O. Baringer (2013) Variability of the Deep Western Boundary Current at 26.5 N During 2004–2009, Deep Sea Res., Part II, 85, 154-168. Rhines, P. B., and W. R. Holland (1979) A Theoretical Discussion of Eddy-Driven Mean Flows, Dyn. Atmos. Oceans, 3(2-4), 289-325.